So…where was I? Oh, yes. First night on the train. It was a long one. The Sunset Limited arrives in San Antonio in the wee hours. As bad luck would have it, this particular night was lengthened by some engine trouble. However, we were underway before sunrise, and I arose to some beautiful West Texas scenery. This route goes through Del Rio, Alpine, El Paso, and Tucson on its way to Los Angeles. It was very beautiful and much more visually interesting than I anticipated. My brother-in-law suggested a trip to Alpine, getting off here, driving a short distance to Marfa for the famous Marfa Lights, and then heading back to Houston. Now that I know what he was talking about, I agree this might be the ideal “baby trip” to make before heading across the country. A trip to Alpine on the train is now On My List! Here you go…an easy one. How fast does the train go? According to one of the staff members, 79 mph is the top speed. I am sure we never got near that speed. A time or two we went faster than the cars on the highways next to us. So I figured probably 60-65 mph tops. And since I just mentioned staff, I just have to say a few words on that subject. 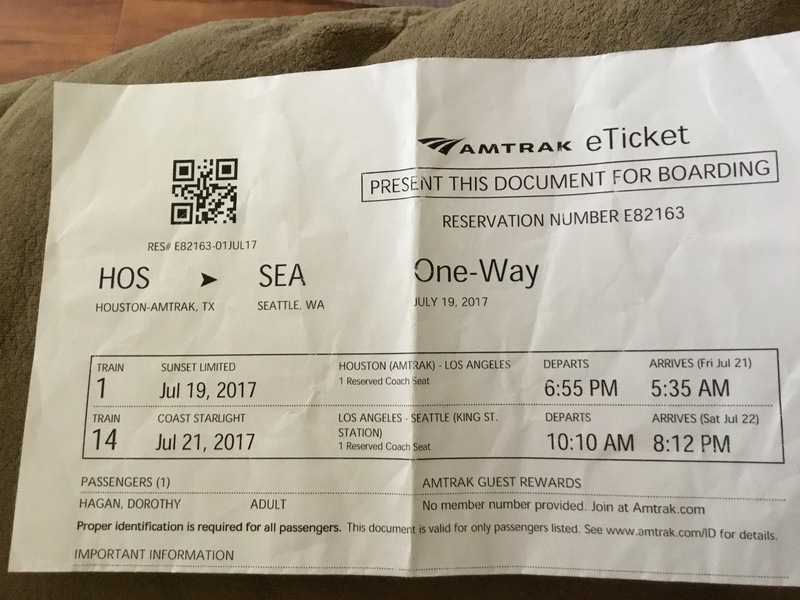 First, I have to state that much of the reason I had enough nerve to undertake this trip was because I have a friend who takes the train herself a lot, and she has a relative who works for Amtrak. Between my friend and her relative, virtually all my wild questions about train travel were answered before I ever left the station. I sincerely appreciated this information. My first interaction from an onboard staff member was John who works in the cafe of the observation car. He works the Houston to Los Angeles run, and it is a long one. He was exceedingly pleasant, clever and cordial. Somehow he made a microwave pizza taste like a gourmet dish. He really was that pleasant. With delays and whatnot, this man and the other staff members worked equally exceedingly long hours. And stayed upbeat, courteous and cordial to the very end of the trip. I doubt my demeanor would have stayed so on target. On the Coastal Starlight, we had Johnny who was in the cafe, and was also very helpful and pleasant on the trip. This leg of the trip seemed to have more eaters and drinkers, and he also kept up with the demands. From the dining car to the conductors, the staff were all stellar. I guess what impressed me most was the conductor on the Starlight. There was a passenger who was quite elderly and impaired, and the conductor himself helped the man downstairs, asked what he wanted to eat, helped him order it and delivered it to his table. Airlines, you might take note of what defines customer service. Overall, the staff could not have been more helpful and inviting. Even with the delays we were kept informed, and treated with every courtesy. Next up: cafe food and the dining car! 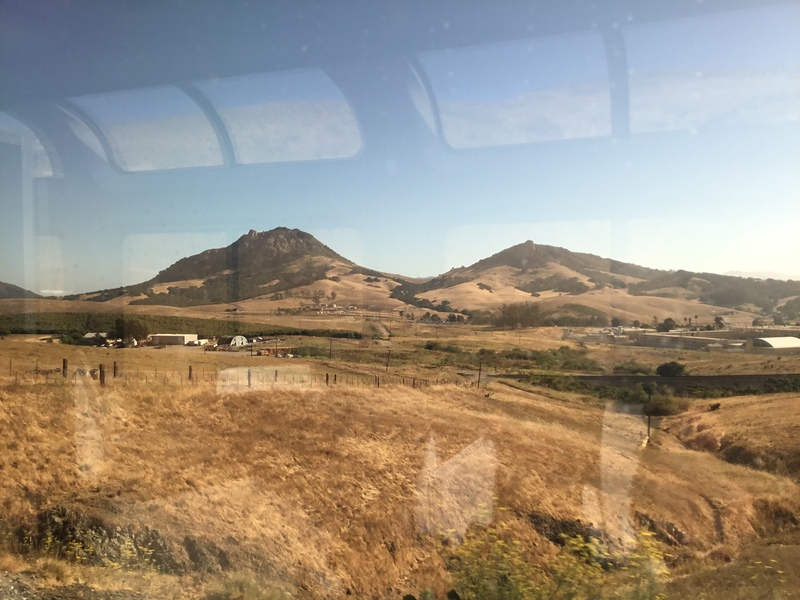 This entry was posted in Amtrak, Bucket List, Coastal Starlight, conductors, Goals, mountains, Staff, Sunset Limited, Trains, Uncategorized, YOLO and tagged Alpine, Amtrak, Marfa, Marfa Lights, Staff, Texas, Trains. Bookmark the permalink.